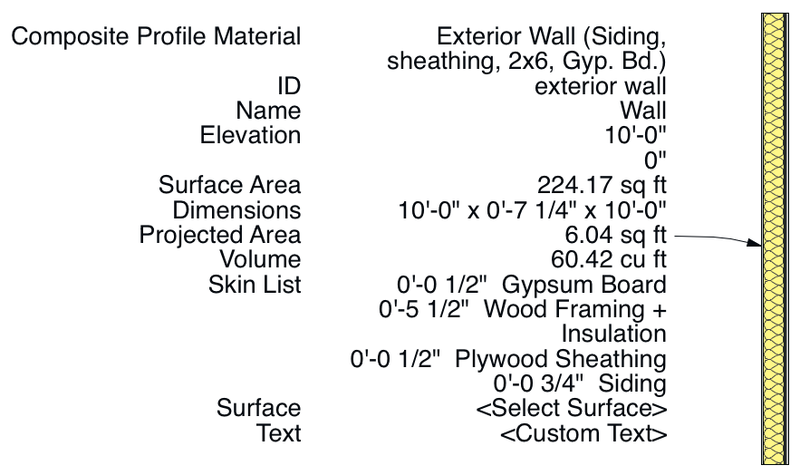 In my last post I wrote about where your data lives—in the View, in the Element, or in the Project—and then talked about how that relates to the improved Labeling capabilities of ARCHICAD 19. If you haven’t read that post, please do. In this post I want to talk more about showing all that data that now lives in more useful places (ie, in Elements and the Project). The Generic Label 19 and the Tags and Categories Label 19 are two powerful Labels you will use a lot. The simple way to think of them is that the Generic Label focuses on the basic ARCHICAD data associated with the Element, especially data that is visible in 3D. 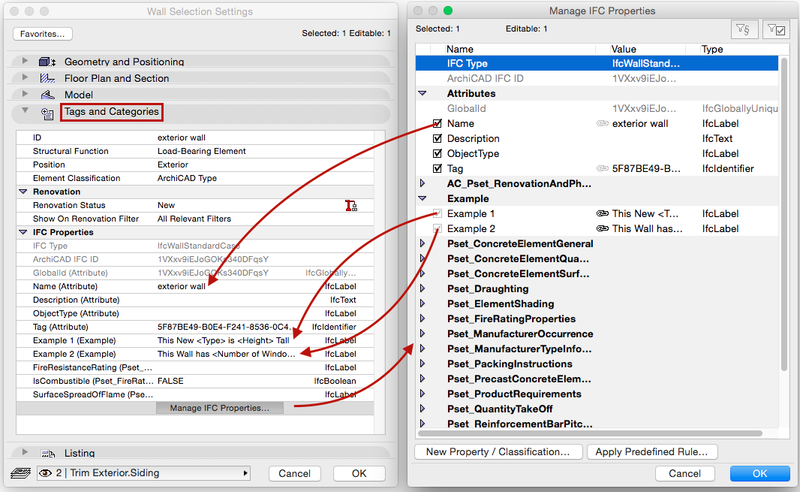 The Tags and Categories Label focuses on the IFC data associated with the Element. Each of these Labels has a bunch of options and can display all sorts of data in a variety of ways. Typically you will use the Label to show only a fraction of what you can show with the Label. Typically. Turning on all the available data and saving both labels as Favorites allows you to easily place either Label on any element to see what data you might actually want to use. You could instead open up the element to check the IFC parameters, go to the IFC Manager, open up Element Information, search through the Info Box or Selection Settings, etc. to see this information, but all of those solutions involve a lot of clicks and scrolls. You absolutely must have a shortcut for the Label tool (mine is ‘K’)—so it will be very easy as part of your work flow to add a Label in any view, look at the data, and then make a decision. Additionally, not only will this help you choose what data you want to use, it will also be an easy way to check that the data is right. Name these two Label Favorites “All On – Tags and Categories Label (for reference)” and “All On – Generic Label (for reference)”. Or something like that that starts with “All On” and references the Label you are using. That way you and your coworkers will see that this Label is something different, and it will be alphabetically near the top of your list—all the easier to grab it and use it quickly. Anything to make ARCHICAD Faster than Ever, right? These two all on Labels make the data more accessible. And if it’s in front of you, then you’ll use it. Read the article I just linked to. It’s one of the rare moments where there is definitively a right and wrong way to use ARCHICAD. There are some other Labels with tons of data to display—for instance for Windows, Doors, and Skylights. I haven’t looked at them close enough to know if they need an All On Favorite as well, but they might. Though my hunch is that if there’s any really important data in those other labels, you’ll want to create some IFC parameters that map that data. But I’m getting ahead of myself. Now let’s look at the Tags and Categories Label 19 with everything turned on and linked to the same wall from my template. Again this looks like garbage, at first. But then we start to see the element’s structural function, the ID again, the Renovation Status, the IFC Type, and more. 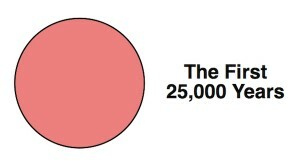 But we also see what’s missing: other IFC data. There are ways to have more IFC parameters on by default (by updating your Favorites or by editing the IFC Scheme Setup), but that’s beyond the scope of this article. To turn on more IFC data manually in my example, I checked a bunch of parameters by opening up the Wall Selection Settings, going down to Tags and Categories, clicking on Manage IFC Properties, and then checking whatever fun stuff I wanted to add. So that’s how we turn stuff on in the element, but now all I’ve done is show off how much the Tags and Categories Label 19 can display. The whole point of this exercise was to use these two Label Favorites as a vehicle to find data we want to use in our annotation. Let’s return to the Label and winnow it down to one bit of data. When you are creating a Label for an element, you want it to make sense. You want it to just say the ID of the element, or maybe it’s dimensions, or some other useful piece of information—or pieces of information if they go together. To do that we open up the Tags and Categories Label 19, change ‘Select Parameters’ to ‘Create Sorting’ instead of ‘Display All’ and also change the ‘Display Data by’ to ‘Parameter Value’ rather than the ‘Value and the Name’. Once we do that, we can select as many rows of data as we’d like. The Generic Label 19 works in a similar manner, but there are check boxes and a Display Order tab. Hopefully my example with the Tags and Categories Label 19 should offer enough clues to tackle the Generic Label, or any other Label. After we switch to one piece of data, what do we get? A pretty label that no one would ever know is 100% automatic, linked to the element, and harnessing all the smarts of ARCHICAD. Look at the two labels below; would you guess that they are pulling all the critical data from the wall they are pointing to? That if we added a window the number would instantly change to 3. Or that if we changed the Renovation Status of the Wall, the note would change from ‘New’ to ‘Existing’. And here’s the window counter: How cool is that? Labels are easy to use and easy to digest. If you create a reference Label that shows you all the information an element contains, you can brainstorm about what you might want to share. When you see all the easily available data, you can think about how to use it, and then you can explore adding more depth via IFC mapping magic. But IFC mapping comes after you can imagine what data exists or might exist in your elements already. 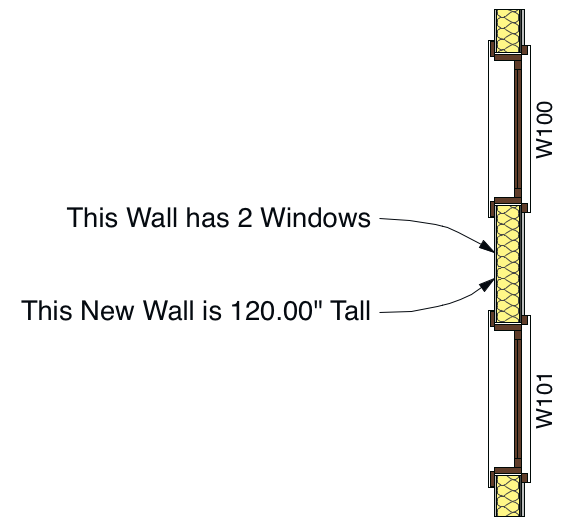 After all, the walls I modeled already knew their volume, area, Renovation Status, number of Windows, etc. I just had to see some of that information in the Label and then explore what else I might want. Of course all of this is in service of one grand goal: automation. The future is about harnessing automation and delegating what you can to your digital tools. 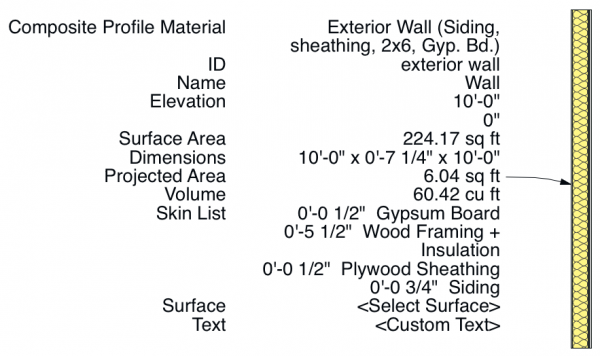 Why count windows if ARCHICAD will do it for you? Why wonder what information is attached to the element if ARCHICAD will tell you? Why type out a Surface or Building Material by hand if that information is already embedded in the element? Automation is the key to speed. 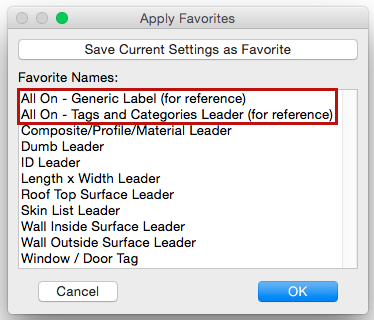 Do you want more information about using Label Favorites—and how you can swap a placed Label with another Label showing different information? I’ve recorded a video showing off the Label Favorites I have in my template. Check out the video here. As should be no surprise, it is a great companion to this and the previous Label post. Finally, as the best way to understand all this is by trying it yourself, go download my template. It’s full of Label Favorites, including these two All On Favorites that I think are an important part of getting the most out of automatic labeling. I think one of the coolest options is the graphic interface. Now even a simple ID label is clear and straight forward. It is also easier than ever to get the label you are looking for, for example an ID label that matches your standard window marker, which is great for denoting a door or window that comes from a GDL object rather than the door or window tool. AC19 labels are amazing, not just because of what we can label, but how we can label and what our labels can look like AND do! Absolutely! I think that might be the next post. Just talking about how to make all the labels look identical. That is totally key so that there is unification. I might start that after lunch. Another fascinating article showing both profound principles and practical examples. Thanks for your ongoing contributions to the ArchiCAD community. You mentioned setting up a Label that looks like a Window or Door Marker to use with GDL objects, which is a cool idea. I like doing this for Elevation drawings, where you can label the windows and doors and make these labels look like the corresponding floor plan Dimension Markers; and of course, they will show the ID of the associated element automatically. I agree that the new label changes are great. I have made a label that extracts the properties script data of our Property Objects assigned to walls, slabs, objects and the other elements via the “Link Properties to Criteria” command. The property scripts generate element descriptions based on the layer and other attribute context that each element uses. I just wish I knew of a way to bring this property object information into IFC schemes. The IFC Manager’s scheme rules don’t quite have the ability to parse the parameter information like GDL property objects have. I attempted to automate my labels by following your directions. The end result is a label with headings but without the info attached or a message ‘this label is not available for independent labels”. What am I missing? Go to the Label Settings. 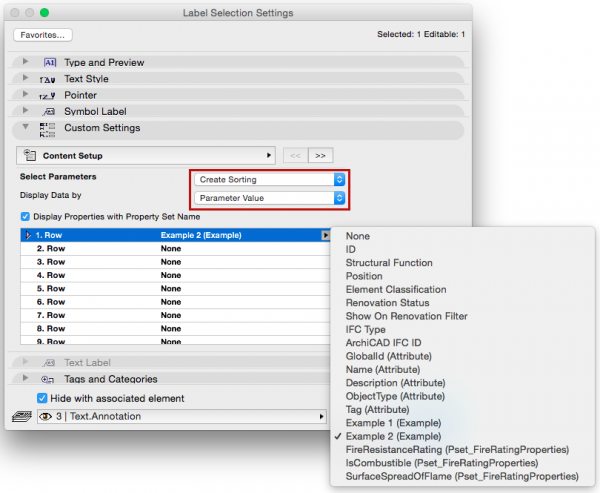 Under Custom Settings/Content Setup, make sure “Display Data by” is set to Parameter Name and Value or Parameter Value. Also make sure the Label is attached to an element and not independent. How can I do this same labeling but in a stair. How can I know the length of the railing, the amount of steps, etc, not just as surface schedule, but in a more graphical manner? I’m not sure the default labels can pull that kind of information. And I don’t know if that data is even extractable from a placed stair. You could manually enter that data as AC Properties and then have the label show that information.